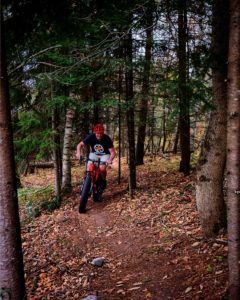 Description: An Introduction to Fat Tire Biking, the Ultimate Backcountry Tool. Topics range from Wilderness Preparedness to On-Trail Bike Maintenance. Riding in All Conditions and All Types of Terrain are Covered. Safety and Group Fun in a Non-Competitive Setting are Stressed. Higher-End Bikes and Helmets are Provided. Advanced Clinics start at our Home Trail. 2/5th of one heck of a Challenging Mile!